It's an Elf on the Shelf special! 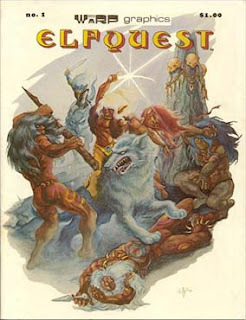 Well....it's ElfQuest #1 for this ninth day of Crusademas, brought to you by Kristatos. The Pinis are pretty well known in the comic book community for this fantasy book creation. We're all aware of it...so why haven't many people actually read it? The lads will discuss that phenomenon and reveal once and for all whether or not ElfQuest deserves it's cult-following status. Death Probe sniffles a lot due to his love for the "winter snow." Somehow Faith No More makes an appearance. Dark Web reveals his greatest Christmas disappointment. This episode has it all! "A Hallelujah Christmas" by Cloverton brings us all the way into the outtakes....where Professor Weasel Skull attempts to educate the other 3 guys...to no avail. Wao! All of days have good material and I love all the days. This day picture is created very goodly. Keep doing such lovely and creative work for our entertainment.